We’re reaching out to give Citizen Foresters and Citizen Forester trainees updates for the month of August! This past month we hosted 4 After Work Tree Times (AWTT), 2 Citizen Forester Classes, a BBQ & Beautify event at Richmond Park, and we graduated 5 new Citizen Foresters- Let’s recap! “Citizen Forester Update” is a monthly feature of the Urban Forest Project that gives us the opportunity to recap the news and events of the last month. Below you will find information and links from July, including mentions in the media, important announcements, blog postings, class photos, upcoming events and more. We continued our After Work Tree Time season on July 6th at Fuller Park where 13 volunteers gathered to crown prune trees along Fuller, Crescent and Innes. Fuller Ave is a two lane street that receives high automobile traffic throughout the day. Low hanging branches were removed to clear them from the road, from buildings or sidewalks, to make signs visible, or to open up a desirable view. Special recognition to Angela and her family for coming out to their first AWTT on July 6th! It was a hoot to have a whole family of pruners out with us! Our big AWTT project this month was on Leonard & Lafayette, split into two parts: Leonard Pt. 1 on July 14th and Leonard Pt. 2 on July 27th. This two session AWTT gave us a chance to check on trees that were planted to replace ones affected by Emerald Ash Borer. Citizen Foresters provided pruning care and finally removed those tree wraps we’ve been driving by for years! 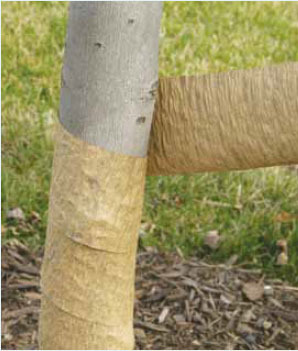 Tree wrap is a temporary material used to protect the trunk of young, newly transplanted, or thin-barked trees during the winter months. It should only be applied around Thanksgiving and removed around Easter. Unfortunately for the trees on Leonard & Lafayette, the tree wrap had been left on the trees for 2 years. It has been found that paper tree wraps left on too long can hold moisture around a trees bark leading to problems with diseases, insects and freeze injury. Severe temperature changes have been found to occur beneath wraps that are left on for more than one season at a time. We were able to remove wraps from over 45 trees, improving their health and natural beauty! Shout out toJosh and Emily Dunnigan for finishing their AWTT requirement and becoming Certified Citizen Foresters at Leonard & Lafayette! The July 19th AWTT was planned by Citizen ForesterDenise in her neck of the woods, Elliott and Eastern Ave! Some of our most dedicated Citizen Foresters, that have been volunteering with the Urban Forest Project for a few years including Heather, Carl and Tom joined us in tackling neighborhood trees that needed some structural pruning and crown thinning. At one point we had over 3 volunteers pruning away at a ruthless mulberry that had spread out into the sidewalk. If you have pruning needs in your neighborhood, contact us and plan a route for an After Work Tree Time– We’ll bring the tools! On July 13th we held our second Tree ID class of the summer at the Garfield Park lodge and on July 20th we talked about advocacy during our course, Branching Out! Hats off to Brooks, Gerry and Emily Johnson for completing their Citizen Forester certification during class this month! During tree ID we learned how to see with our “forester eyes.” By using these eyes we begin to look among the leaves, meaning that we take the time to identify a tree’s key characteristics and features. Remember to break down trees into their physical parts: identifying the characteristics of its leaf, flower, fruit/cone/seed, branch type, bark, and crown form. 1. What Tree Is That? the Arbor Day Foundation’s illustrated, step-by-step identification guide. 2.Dr. Dendro is actually Dr. John Seiler, and you can use the Virginia Tech tool starting with a leaf, a twig, or both. 3.What Tree Is It, a web-based reference, from the Ohio Public Library Information Network and the Ohio Historical Society, uses leaves and/or fruit (and focuses on trees common to Ohio—though many are also throughout Michigan, so relevant to us)! 4.And with beautiful photos there is Rogers Trees and Shrubs, where you can start from leaf images. You can even add your own images to the collection! We maintained trees planted by the Urban Forest Project in 2013 at Richmond Park last week. Volunteers watered all the trees, pruned some damaged branches and even picked up a whole wheel barrel of large, dead sticks and twigs throughout the park. Big thanks to Citizen ForesterHeather for managing volunteers & the tool trailer, and to Citizen Forester Gerry for being a lead water and pruning volunteer during the event!The BBQ series is a positive step toward bringing Friends of GR Parks’ staff and our dedicated volunteers closer to the communities we serve. We’re hosting the BBQ & Beautify series for three key reasons; to bring neighbors together to celebrate our unique parks, to give people the chance to speak openly about their dream for our parks system, and to provide an opportunity for neighbors to maintain and improve their park and trees together. Find out more on our recent FGRP blog post,here. Know any GRPS teachers, parents, or administrators? We’re looking for teachers interested in sharing tree knowledge with their students this fall! Planting for Our Future (PFOF) is a project geared towards helping children understand the benefits of trees in their communities. As a part of this project, we are offering teachers and school administrators and/or collaborating GRPS/parents the funding, technical assistance, trees, or support to host an Urban Forest Project event within their school! For more information visit our seedlings blog! In case you haven’t noticed, Cherry Park is looking less shady these days. Sadly, a beloved bitternut hickory was lost at Cherry Park after succumbing to heavy winds in mid-July. Find out the age of the tree, estimated by trainee Margaret Werderits on our seedlings blog! As always, thank you for believing in the problem-solving role that trees can play and thank you for taking action with the Urban Forest Project. We hope you have a safe and enjoyable Fourth Of July holiday!